Voting begins on April 11 and will continue till May 19. The week from April 11 to May 19 is election season in India, and the largest democracy in the world is bracing itself for the days ahead. Voting will be held in all of India's 29 states and seven additional small union territories, with the final results announced on May 23. India has an asymmetric federal government, with elected officials at the federal, state, and local levels. The prime minister is the head of government and they're elected by the members of Lok Sabha, the lower house of parliament. An estimated 900 million people, including 432 million women, will cast their votes to elect 543 members of parliament from single-member constituencies. More than 8,000 contestants will fight for these seats. There will be 10 million election officials at work and the total election cost is stipulated to be an unprecedented Indian 500 billion Indian rupees (7,22 billion USD). This year, the election will see intense competition as incumbent Prime Minister Narendra Modi and his Bharatiya Janata Party (BJP) is hoping for re-election after a landslide victory in 2014. He will be challenged by Rahul Gandhi and his party, the Indian National Congress, the main national opposition party which ruled India for most of the period since its independence in 1947. Rahul's grandmother Indira Gandhi was a long-time Prime Minister, and his grandfather, Jawaharlal Nehru, was the country's founding Prime Minister. BJP leads the National Democratic Alliance (a pre-poll alliance) consisting of around 20 parties, including right-wing Shiv Shena, AIADMK, Janata Dal, and Shiromani Akali Dal. On the other hand, the United Progressive Alliance, led by Rahul Gandhi's Indian National Congress, consists of more than 25 parties including DMK, Nationalist Congress Party, and Rashtriya Janata Dal. Other regional parties like Samajwadi Party from Uttar Pradesh, Aam Admi Party from Delhi, Trinamool Congress from West Bengal and Bahujan Samaj Party may be crucial in forming a proposed United Opposition Alliance to stop Bharatiya Janata Party's reelection. 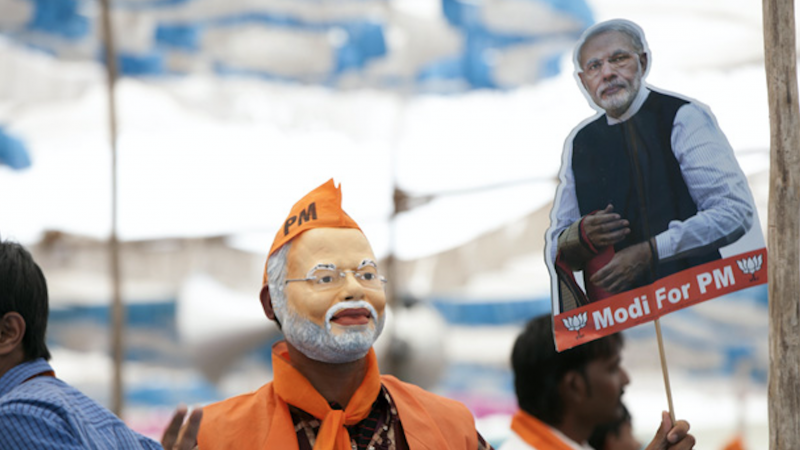 Recent opinion polls put Modi-led National Democratic Alliance ahead of the competition; however, a lot can change during the election season. In 2014, Modi's Bharatiya Janata Party relied heavily on social media to clinch a landslide victory. Two years ago, Modi predicted that the battleground of the 2019 elections would be on mobile phones. This year, as expected, the campaigns are using social media, with a battle of hashtags employed to malign the competitors. Read: Hashtag battle in India as candidates go head to head in 2019 summer elections. According to a report by Scroll.in, BJP has spent heavily on advertisements on Google and Facebook. Another report in the Huffington Post suggests that BJP has used non-profits to run sophisticated misinformation campaigns to spread fake news and false claims on social media and WhatsApp. According to reports, Vivek Oberoi, the lead actor of Modi biopic, is most likely to campaign for BJP even though producers denied having any connections with BJP. Also, a campaign song of the Indian National Congress was flagged by the Elections Commission. Many political activists have demanded close monitoring of social media regarding unlawful election campaigns and the spread of disinformation. Election Commission of India: Do not politicize the Indian Army. To facilitate voters and candidates in making the #Elections2019 a grand success, Election commission of India is enabling stakeholders with best technology. A recent BBC report suggests that WhatsApp has become a vehicle for misinformation and propaganda in the upcoming election. With over 250 million users, it is India's most popular messaging platform. Read: India's elections are right around the corner — and the fake news problem is not going away. In response to pressure from the Indian government, WhatsApp has taken a series of steps such as deploying a technical change to the app which reduces the number of users a message can be forwarded to at one time and by undertaking awareness campaigns through newspaper ads and workshops. According to Facebook’s Director of Public Policy in India and South Asia, Shivnath Thukral, the company has also taken a number of key steps to ensure election integrity. Facebook has taken down 2 billion fake accounts and it relies on its largest fact checking partner program in India. It has also launched ad transparency tools and vowed to set up a war room comprising of nearly 40 teams across the company in New Delhi to tackle the information flow during the election. However, people still have high hopes for this election.